There are officially 59 days until the toe meets the ball at AT&T Stadium where the Dallas Cowboys will host the New York Giants on NBC’s Sunday Night Football. What a beautiful day to Throw Up The X! Cowboys fans across the globe are celebrating the recent long-term extension of wide receiver Dez Bryant. There is no exception here at Inside The Star as we’re getting all the more excited about the 2015 season. You should also be excited about the Cowboy featured on today’s Countdown to Kickoff, the Greatest 59 in Dallas Cowboys History. There are many different types of accomplishments that we’ve highlighted in our Countdown to Kickoff series. We’ve had Pro Football Hall of Famers. We’ve had people who broke records. We’ve had people who switched positions. We’ve had players from the offensive line of the early 2000s, which was the first starting offensive line to have all five of its starters be African American. Today we have a Dallas Cowboy who was a pioneer with every step and every tackle that he made in the NFL. During the 1999 NFL Draft, the Cowboys had a player that they were looking at taking in the third round. He was a linebacker from Texas A&M, the leader of the famed “Wrecking Crew” defense, with a smaller build than most linebackers. His trophy collection was pretty full as he had picked up the Big 12 Defensive Player of the Year, Chuck Bednarik Award, and the Lombardi Award all in his senior season. He had Dallas Cowboy written all over him. Dat Nguyen was chosen by the Cowboys with the 85th overall pick in that draft and made an impact, as all great linebackers do, right away. During his rookie year he led the special teams unit in tackles with 18 and he was promoted to starting middle linebacker in his second year. While Dat was the first Vietnamese-American Player to ever be drafted, he didn’t stop succeeding there. After he was named the starting middle linebacker Dat flourished as the leader of the Cowboys defense, leading the team in tackles in 2000. He had a grit that could not be tested, as exemplified in a game in 2002 where he broke his wrist…and still finished the game with a team-leading 11 tackles. Dat’s finest season perhaps came in 2003. He led the team in tackles yet again, a team with the second most effective defense across the NFL, and was selected to the Pro Bowl as an alternate. Nguyen was also announced as a Second-Team All-Pro in 2003 and he won the Ed Block Courage Award... which personifies a player's inspiration, sportsmanship, and courage. Dat Nguyen is one of the finer men to ever put on a Dallas Cowboy uniform. He approached football and life with a fierce commitment to always excel, which is highlighted in his book “Dat: Tackling Life and the NFL”. The middle linebacker position is by nature one that demands a lot from people. Dat Nguyen gave everything he had not because he was a middle linebacker but because that’s the person that he is in ever facet of his life. He is without a doubt the Greatest 59 in Dallas Cowboys History. Check back tomorrow to find out who the Greatest 58 in Dallas Cowboys History is! 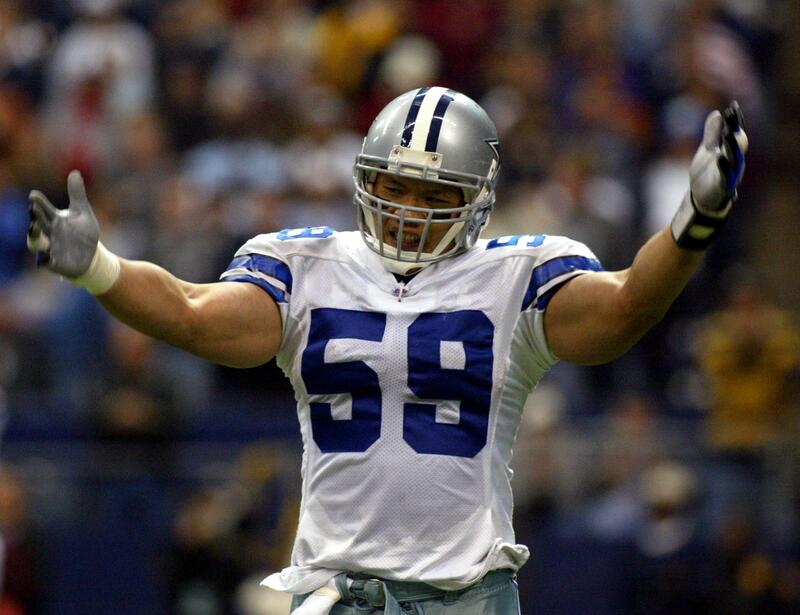 Tell us what you think about "Dat Nguyen Tackles His Way To #59" in the comments below. You can also email me at RJ.Ochoa@SlantSports.com, or Tweet to me at @RJOchoa!